Welcome to beautiful Kimberley, British Columbia, a good place to be! Kimberley was named in 1896 after the Kimberley mine in South Africa; the town even has an Underground Mining Railway with a 750-foot-long underground mining interpretive center! Nowadays, Kimberley is mainly a tourist destination and growing faster than any other town in the region. This stunning mountain town, situated between the Purcell and Rocky Mountain ranges, is home to recreational pursuits such as world-class skiing, snowboarding, snowmobiling, fishing, rafting, kayaking, biking, hiking and golfing on championship golf courses. 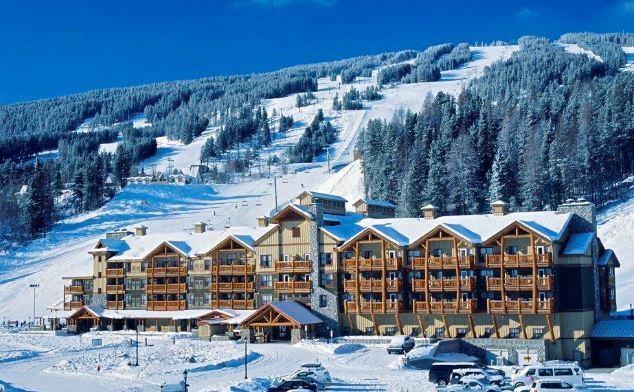 The town used to be known as the “Bavarian City of the Rockies”, but now is easily one of BC’s favorite ski towns; with eclectic restaurants, new lodging and fun activities popping up, while still maintaining the authentic Canadian ski town charm. Kimberley Alpine Resort is located between the Rocky and Purcell mountain ranges in the southeast corner of BC, Canada; and only 20 minutes from the Canadian Rockies Airport, 3 hours from the Kalispell Airport, 4 hours from Spokane International Airport, and 4.5 hours from the Calgary International Airport. Kimberley Alpine Resort offers 1,800 acres of skiable terrain, over 16 feet of snow per season, the resort with the most days of sun in BC, North America’s longest night-skiing trail (included in your day pass!) and North America’s largest gladed ski terrain. Intermediate terrain accounts for 42% of the mountain, making it a haven for intermediate skiers, but also beginners and advanced skiers and snowboarders alike. Your 3+ day multi-day Kimberley Alpine Resort lift ticket is also valid at Fernie Alpine Resort and Kicking Horse Mountain Resort. There’s gold in those mountains!! Well not exactly, but in 1892, prospectors Bouregois and Langille were searching the mountains for minerals and discovered a lead zinc called galena. The first claim staked was the North Star, the location of present-day Kimberley Alpine Resort. As the town started becoming better known, more and more people moved to the area, partly due to the enormous wealth of recreational activities. Today, it is a popular and affordable year-round community with a laid-back attitude and collective passion for what the city has to offer: fishing, skiing, golfing, hiking, biking, hot springs and more… and the friendly and enthusiastic locals greet visitors warmly. The town also attracts a variety of successful people, including athletes, gold medalists, NHL players, authors, movie producers, artists and musicians, who now call Kimberley home.